Kim and Cocoa: I am still here!! Hello to all and sorry it has been so long since my last post! Things have been very busy with work lately. Cocoa is doing well. 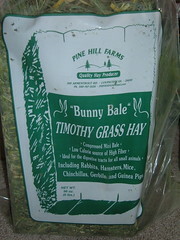 I recently got his first "mini bale" of hay from Bunny Bales. It's 6lbs, so it should last a while. 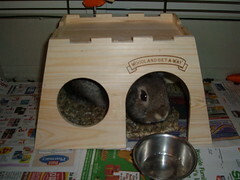 And, I also got Cocoa a castle, which he loves! Every night he sits on top of the castle and sleeps. It's very cute!! I still cannot wait to build Cocoa an NIC cage. That won't be before July though, since I'm moving to a new place at the end of June. 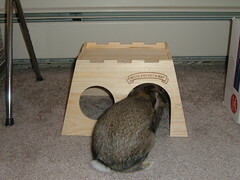 I think his current cage is big enough, but I know he would enjoy having two levels. cool castle - archi's jealous! yeah the furminator is expensive but did you see the pic of archi ann shedding on my page - i think i need it for her!!! and it seems like it would work well. i can get it thru my web store and get $$ back so i like that! Hello there, we like your castle/hiding place!